The Royal Exhibition Building housed the Victorian State Parliament during the war and, as part of the local battle against the post-war influenza pandemic, it was transformed into a Spanish Flu hospital between March and August 1919, treating more than 4000 people. This is the last stop of the tour. The Royal Exhibition Building has a long history. It was built for the Melbourne International Exhibition of 1880/81 and along with the Carlton Gardens, was inscribed on the World Heritage List in 2004. It is an outstanding monument to 19th century International Exhibition movement. But during WW1, it played some very different roles. Melbourne was the home of the Federal Parliament until the opening of Parliament House in Canberra in 1927. Consequently, Parliament House in Spring Street was the seat of the Federal Parliament and the western annexe of Royal Exhibition Building was used by the Victorian State Parliament. The Victorian Parliament was bound by the restrictions placed on it by the Federal Government and in particular the provisions of the War Precautions Act 1915. However, one of the few wartime measures enacted by the Victorian Parliament was the Intoxicating Liquor Temporary Restriction Act. This restricted pub hours from 9am to 6pm, and was designed to increase workers productivity and encourage enlistment. And so the notorious ‘6 o’clock swill’ was born, which continued right through to 1966 when the measures were finally abandoned. When WW1 finished in November 1918, the soldiers prepared themselves for a joyful homecoming. But tragically, worse was to come. 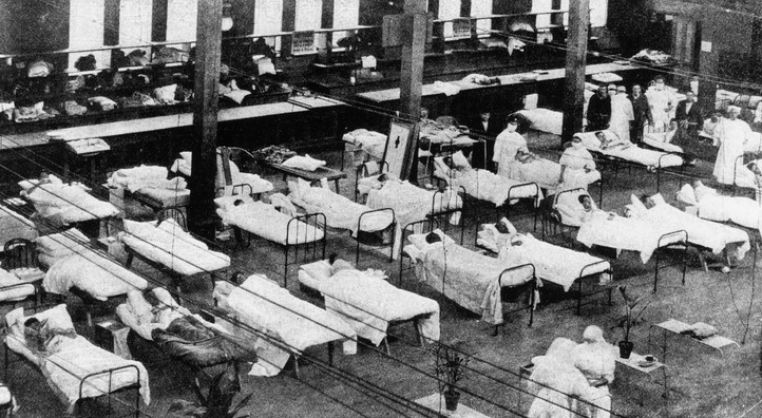 December 1918 saw the outbreak of the Spanish Influenza pandemic, the most deadly natural disaster in human history. It took hold in the battlefields of Europe and spread around the world with the returning soldiers, wreaking havoc and killing somewhere between 50 and 100 million people worldwide. In January 1919, authorities declared that the disease had reached Melbourne, which subsequently spread through Victoria. People were encouraged to wear masks in shops, hotels, churches and other public places. Public meetings of 20 or more people were prohibited and long distance train travel restricted. As part of this new battle, the Royal Exhibition Building was transformed into a Spanish Flu hospital between March and August 1919. Around 500 beds were initially set up inside the building, growing to accommodate 2000 patients. Over 4000 people were treated in the 6 months, 392 of whom died. Apparently this was quite a good survival rate, but around 12,500 Australians died during this dreadful postscript to what was a tragic period of history. Once the war was over and some sense of normality started to return to people’s lives, memorials to the war sprang up around the country. In August 1921, the Australian War Museum opened an exhibition of photographs in the eastern annexe of the Royal Exhibition building. It ran for 5 weeks and attracted over 80,000 people. A second exhibition of objects and dioramas opened on Anzac Day 1922. The Australian War Museum was relocated to Sydney in 1925 and then to Canberra in 1935, and renamed the Australian War Memorial. The Royal Exhibition Building continued as the Australian War Memorial’s principal store until the 1940s. We hope you have enjoyed the tour and discovered some of the hidden WW1 places and stories of Melbourne. You can continue the journey of discovery about WW1 at the Melbourne Museum. The exhibition ‘WW1: Love & Sorrow’ explores the experience of the war and its aftermath through the lives of ordinary people. It is a must-see complement to this audio tour.